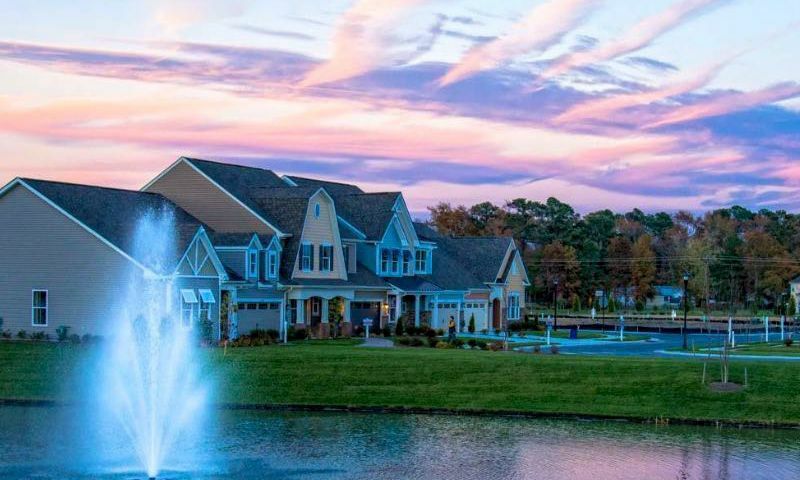 Bishop's Landing is an active lifestyle community located in Millville, DE. Residents love the low-maintenance lifestyle and wonderful amenities within Bishop's Landing. With a sterling clubhouse and several home styles available on a new or resale basis, Bishop's Landing is sure to please homeowners looking to lead active lifestyles in a beautiful home. At the center of the community is the 10,000 square-foot clubhouse. Staying fit is fun with a fully equipped fitness center and an aerobics and dance studio. Locker rooms are also available for getting ready for a workout. Neighbors can also gather for social events in the meeting rooms or attend a meeting in the conference room. Homeowners can also prepare a meal in the catering kitchen. The amenities continue outdoors, with an Olympic-sized pool, spa, and sundeck, perfect for enjoying the warmer months. Two tennis courts, fishing lakes, and beautiful parks make exploring the community a constant adventure. A dog park and walking and biking trails ensure that both you and your four-legged friend can get some exercise outdoors. Beazer Homes began construction on Bishop's Landing in 2013 and upon completion will host 449 homes. Available on a new and resale basis, these homes vary in size and style, ensuring that buyers will find the home that's just right for them. There are four attached home plans that range in size from 1,883 to 2,335 square feet and all offer three bedrooms, two-and-a-half bathrooms, and an attached one to two-car garage. The single-family homes within Bishop's Landing offer between 1,712 and 3,007 square feet of living space and have three or four bedrooms, two to three-and-a-half bathrooms, and an attached two-car garage. Homeowners love all the natural lighting, open floor plans and modern kitchens. Homeowners also don't have to worry about lawn care because it is covered in the association fee. Residents are continually planning fun events and activities for neighbors to enjoy. Festivities include holiday parties, luncheons, and movie nights. Get into shape with friends with yoga, Zumba, tennis, walking club, or water aerobics. New neighbors become fast friends thanks to organized happy hours, crab feasts, or by joining the book club. No matter what your interests are, Bishop's Landing will have something for you. Bishop's Landing is located in Sussex County, Delaware. It is conveniently located down the street from Hocker's Grocery, banks, and restaurants. Cross state travel is easy with route 113 just a short drive away. Baltimore, Philadelphia and and Washington D.C. are all within driving distance from Bishop's Landing, each providing world-class entertainment and international airports for farther travel. Nanticoke Memorial Hospital is 30 miles from the community entrance. Southern Delaware has plenty of attractions to keep residents active. Just in the immediate area, homeowners will have access to Bethany Beach, Fenwick Island State Park, Assawoman Wildlife Area, and Holt's Landing State Park. Millville has the Dickens Parlour Theatre. Nearby Millsboro offers golf courses, a marina, and restaurants. Bishop's Landing offers the desirable area and amenities to make it a great active lifestyle community in Millville, DE. There are plenty of activities available in Bishop's Landing. Here is a sample of some of the clubs, activities and classes offered here. There are three models in the Beach Villa collection. These attached homes range in size from 1,883 to 2,338 square feet and have three bedrooms, two-and-a-half bathrooms, and an attached one to two-car garage. The Ocean Villas have one model that offers three bedrooms, two-and-a-half bathrooms, and an attached two-car garage. There are six single-family home models from which to choose. These homes range in size from 1,712 to 3,007 square feet and offer three or four bedrooms, two to three-and-a-half bathrooms, and an attached two-car garage. A wonderful community to meet new people. Many activities with a great pool and clubhouse. 55places.com is not affiliated with the developer(s) or homeowners association of Bishop's Landing. The information you submit is distributed to a 55places.com Partner Agent, who is a licensed real estate agent. The information regarding Bishop's Landing has not been verified or approved by the developer or homeowners association. Please verify all information prior to purchasing. 55places.com is not responsible for any errors regarding the information displayed on this website.